Best soul series ever! 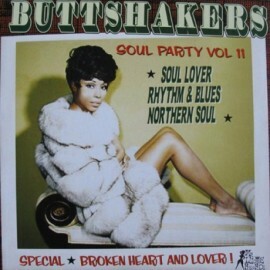 Volume 11 presents "Soul Lover Rhythm & Blues & Northern Soul"
Harvey Scales & The Seven Sounds - I Can't Cry No More/ J.A. Tyler - One Monkey Don't Stop No Show/ Lattimore Brown - A Mistaken Prayer/ Willis Wooten - Your Love Is Indescribably Delicious/ John Wesley - You're Gonna Miss Me/ Bobby Holley - Baby, I Love You/ Larry Williams - Call On Me/ Kent & The Candidates - I Gotta Feelin'/ Little Hooks & The Kings - Something Money Can't Buy/ Len Johnson & The Hi-lighters - Nobody But You/ Louis Jones - That's Cuz I Love You/ Willie Dixon & The Big Wheels - Our Kind Of Love/ Tyrone Davis - All The Waiting Is Not In Vain/ Sterling Harrison - The Church Bells Ring.